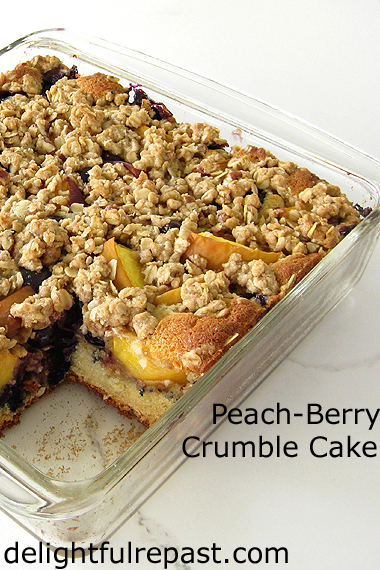 Peach-Berry Crumble Cake is for those occasions when you’re in the mood for a crumble but you don’t have enough fruit. Or when half the family wants crumble, and the other half wants cake. People always ask me for this recipe, so that’s a good sign you’ll like it, too. And it’s so easy. No need to bust out the big stand mixer, just use a hand mixer or even a spoon. The most important part of any recipe that includes peaches is, of course, the peaches. A friend told me yesterday that she doesn’t buy peaches anymore because she never gets good ones. If you have that problem, just do what I do: go by color and smell. Look for yellow peaches with good color and no green shoulders (area around the stem). Then give each peach the sniff test. If it doesn’t smell peachy, it won’t have much flavor. Are you a peach fan? What is your favorite summer fruit? 1 Preheat oven to 350F/180C/Gas4. Butter (or spray with cooking spray) an 8-inch square baking dish. In small 1.5-quart mixing bowl, whisk together oats, flour, sugar, pecans, salt and cinnamon. With your fingers, rub the butter into the dry mixture, leaving some larger chunks of butter. Remove 1 cup of crumble from the bowl. 2 Prepare fruit. I rarely peel peaches for anything, just scrub them well. Measure vinegar into 1-cup glass measure; add enough milk to make 3/4 cup. Stir and let stand about 5 minutes to thicken a bit while you proceed. 3 In medium 2.5-quart mixing bowl, whisk together flour, sugar, baking powder, baking soda and salt. Add the softened butter; with electric hand mixer, mix on low speed until cut in. Add soured milk, eggs and vanilla. Mix on low speed for 30 seconds to combine, then on medium speed for 1 minute. 4 Pour into prepared pan. Scatter 1 cup of the crumble over the batter, add a layer of fruit, and top with remaining crumble. Bake for 45 to 55 minutes, or until golden and a toothpick inserted in the center comes out clean. 5 Cool in pan on wire rack for 20 minutes to serve warm, or let cool completely and serve at room temperature. Not only does this look delicious but it is so visually pretty as well! Thanks for sharing another lovely dish Jean! I'm forever bookmarking your good recipes, Jean! I have some peaches in the fridge. Thank you, Bernideen! Anything is pretty with peaches! Thanks so much, Karen. I really appreciate that. I hope you'll like this one as much as we do! I'm going to make it again this weekend. I really like this recipe, Jean, as it's the best of both worlds - a crumble and a cake! It's lovely you just need a bowl and spoon as well. I know my family will love this and I can't wait to give it a try. Sharing, including on the H&S Facebook page. Thank you so much for your support of the Hearth and Soul Link Party. 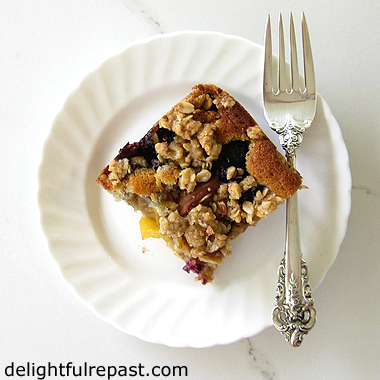 Stone fruit and berry are such a great combo for streusel cakes or any tray bake. Yours turned out bakery perfect, Jean. LOL, yes we both had this marvelous combo on the menu recently! I make tons of peach desserts when they're in season and pairing with any berry is always a hit with the family. Your crumble cake looks magnificent!! April, thank you AND thank you for hosting the Hearth and Soul Link Party! Thanks, Angie! That means a lot coming from such an excellent baker as you. My Mum always made crumble with just sugar, butter and flour. You have used oats, which make your crumble look extra rugged,rough and crumbly. The pioneering spirit coming through I should imagine, Jean. We used to watch Wagon Train on BBC in the late 1950s when we were kids. It was in black and white.All those beans must have been good for the digestive system!! Ha! Ha!Rugged, hard and tasty just like your crumble Jean. Now, if I was to come round for a cuppa could I have a piece? I'd kill for just one fresh, sweet juicy peach! Haven't had one in years because - just not available. Nectarines either, or apricots! Oh my apricots, been a good 30 years since I've had an edible fresh apricot and let's not even discuss persimmons. I figure somewhere in this country people have access to fresh fruit that actually tastes like fresh fruit but certainly not where I live. I love peaches and your recipe looks yummy,Jean!Hugs! Yes, I'm a peach fan! Every summer, a peach festival is held near my town, but I keep missing it! I love summertime for the fruits it brings. But peaches are nice too, thanks for sharing your recipe. Thanks, Tony! Yes, we'll give you a cup of tea and bit of cake any time. Thanks for reminding me of Wagon Train. Last time I was watching YouTube on the television, I saw several episodes of Wagon Train listed. Must watch one and see how well the show holds up. Jaki, thank you AND for #TriumphantTales! Maristella, thank you. And peaches are so pretty, which I know you appreciate! Late to the table and just home from a (S)wis(s)consin road trip, including the Dells. Glad to find your crumble cake awaiting me, as it awakens the same taste buds that have sampled yogurt with fruit and crumbles for the last several days. Whatever the origin, it sounds Scandinavian. Sully, always happy to tingle those tastebuds. A "(S)wis(s)consin road trip" sounds delightful, especially with lots of yogurt with fruit and crumbles. I think I'd like the Dells very much. Liz, thank you! Peaches really are the best, aren't they! I'm very fond of summer peaches, so that, your crumble-cake is perfect. Love the texture and I imagine that it must be delicious. Thank you, Marisa! It IS the texture that I love. Just in time for our fresh Colorado peaches. Looks delicious Jean. Thanks, Lea Ann! Those Colorado peaches are something special. This looks like a keeper! Thanks, Jean! If it means anything, Jean, I would’ve asked for the recipe once I saw the photo! I love crumb (or crumble) cakes – they are perfect for breakfast, afternoon tea, or dessert. And with the quality of the peaches this year, this will be a knockout! Thanks, Jeanie. Perfect for life at the cabin! Oh, David, thank you! And, yes, the peaches *are* exceptionally good this year. I haven't gotten a bad one yet. I love the way you started this post..."when you don't have quite enough fruit..." that's my problem so often! Especially with peaches. Either I've snacked on too many or just underestimated how many I'd need. This looks delicious! Excellent: a "combo" recipe and no fancy equipment needed... You're pushing my hot buttons, Jean! That's a fine and very inviting combination of cake and crumble. My wife thinks that crumble is the perfect, slightly indulgent breakfast and I'll eat cake at any time of the day or night and so it would suit us both very well. The supermarkets around here seem to prefer to sell peaches that are not as ripe as they should be although I've had some very fine white peaches lately. I do look forward to the plum harvest every year. Plums can be very dull in the shops but traditional varieties eaten when very fresh from a tree are wonderful. Thank you, Melissa. So true -- "snacked on too many" is usually MY problem! Thanks, Phil. To me, this is a fine breakfast cake. White peaches can be quite a treat on their own, but I don't like them in baking. And a good plum is one of my favorite foods in all the world. Unfortunately, my favorite variety doesn't seem to be sold commercially, so I need to find a friend with a tree. Thanks, Roseann! Perfect for summer. Yummmm, Jean! Having grown up canning, freezing, jamming and drying apricots, apricots are my favorite, followed by a good firm yellow peach. It's peach picking season here and I've already made peach crisp (and go figure--apricot crisp). Mid-August the best yellow peaches are ready here in the Rogue Valley of Oregon. I'm always tempted to overbuy on these peaches so I can binge eat them. Sue, I'm so sorry your husband (and you) had to go through that. I hope it will be smooth sailing from now on. Hope you both enjoy the cake. I love apricots, too, almost, but not quite, as much as yellow peaches. I tend to binge on summer fruits! Picture perfect and I bet it was delicious, too. Ellen, thank you. I'm sure you'd like it! OH. MY. WORD! This looks absolutely wonderful!!! I know my family would totally enjoy your Peach-Berry Crumble Cake. I'm pinning this for sure. This sounds just delicious. I love this time of year with all the fresh fruit for baking. Yummm! Now I must figure out what to do with figs, as my tree is full and they are beginning to ripen. Any suggestions? Thank you, Dean! Cut into 8 o 9 servings, it comes in under my daily sugar allowance! Marilyn, thank you. And, YES, I have fig recipes on the blog. Just wish I had some figs right now! Love crumble anything! And summer fruit is the best, so what a terrific way to use some of it. Wonderful recipe -- thanks. KR, thank you. Summer fruit is definitely my favorite thing about summer. I am a big fan of both cakes and crumbles so I love this gives me the best of both worlds!